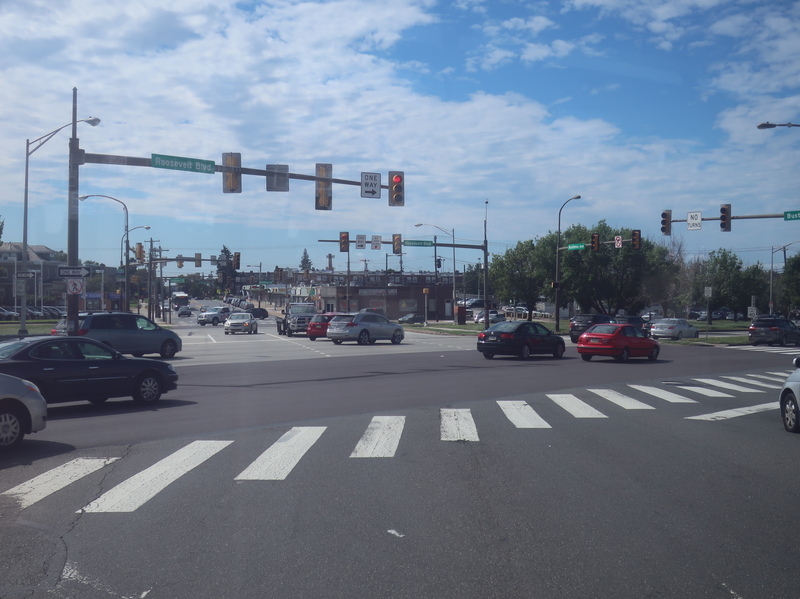 It’s time to spend some quality time on Roosevelt Boulevard. This road is among the ranks of Route 1 in West Palm Beach, FL, Route 1 in Saugus, MA, and Route 1 in South Jersey as being one of the ugliest I’ve ever seen. Oh, and Roosevelt Boulevard is Route 1, too! Look, I know Route 1 has pretty parts to it, but there’s no denying that this road tends to attract a lot of horrible suburban sprawl. Anyway, let’s take a long and depressing journey on the 14, which spends most of its length on the ol’ Boulevard. It’s pretty weird to see articulated buses way out here. Not as weird as seeing them in Doylestown, but still pretty weird. As one of the most complex routes on SEPTA (and that’s saying something), the 14’s service patterns are enough to make your head spin. 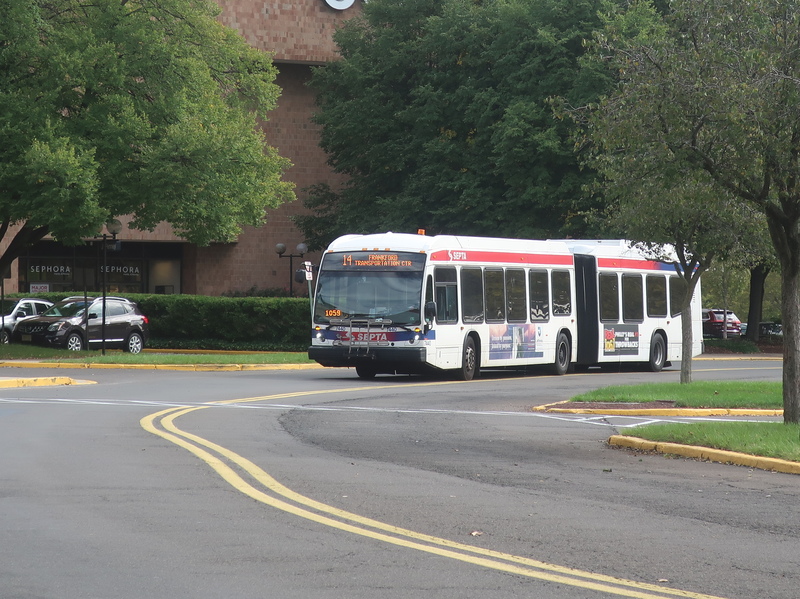 The important thing to know is that most trips terminate at the Neshaminy Mall, but some of them continue on to the Oxford Valley Mall, which is a full 20 minutes further out. Those are a lot less frequent, so all I can say is…thank goodness there’s a big indoor mall here to wait at. Time for the trek to Frankford. As much as I hyped up Roosevelt Boulevard, the route does not actually begin on it. No, the first main street the route traverses after leaving the Oxford Valley Mall is Maple Ave, and while it’s no Boulevard, it is a horrible road lined with industrial car lots. That said, it got a lot more leafy after we crossed I-295, the West Trenton Line, and Route 1. There was even a semi-dense, semi-charming downtown-type area, but we turned onto Pine Street a block before it. Guess I’ll get my “bus inception” photo out of the way early. Pine Street was total woods as it crossed over Route 1, passing a street literally called “Woods Drive”. It curved to the right, then we made a left onto Bellevue Ave, running through a leafy residential neighborhood. That ended abruptly when we hit Langhorne Station, with a connection to the West Trenton Line, or the…ahem…”R-3″, according to the announcement. SEPTA, if you’re gonna get rid of the R designations, can you at least eradicate them entirely and stop reminding us that it’s a far better system that what we have now? Ooooh, a BIG carpet sale! There wasn’t much to see around the station, just some ugly businesses with big parking lots. Indeed, they continued as we turned onto Lincoln Highway, at least until it became woods and industrial buildings. 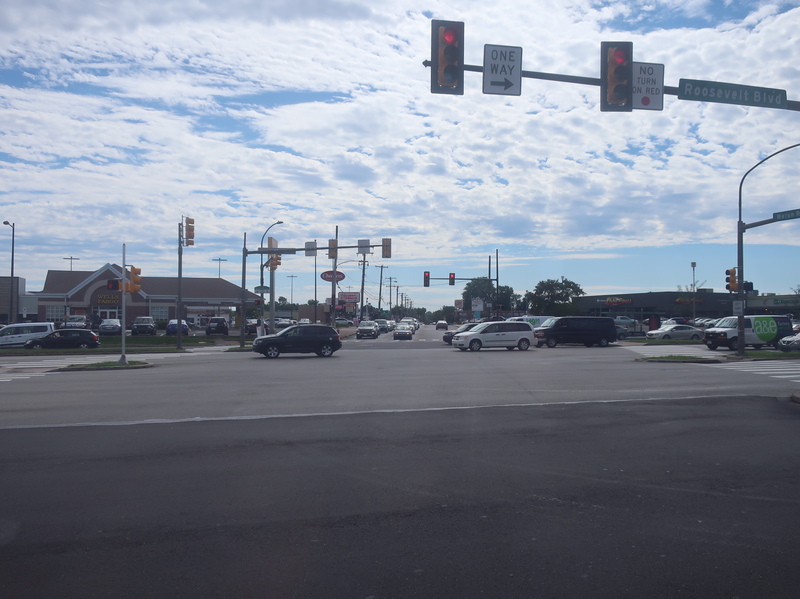 We navigated an interchange to get onto Route 1, but it was still called Lincoln Highway. 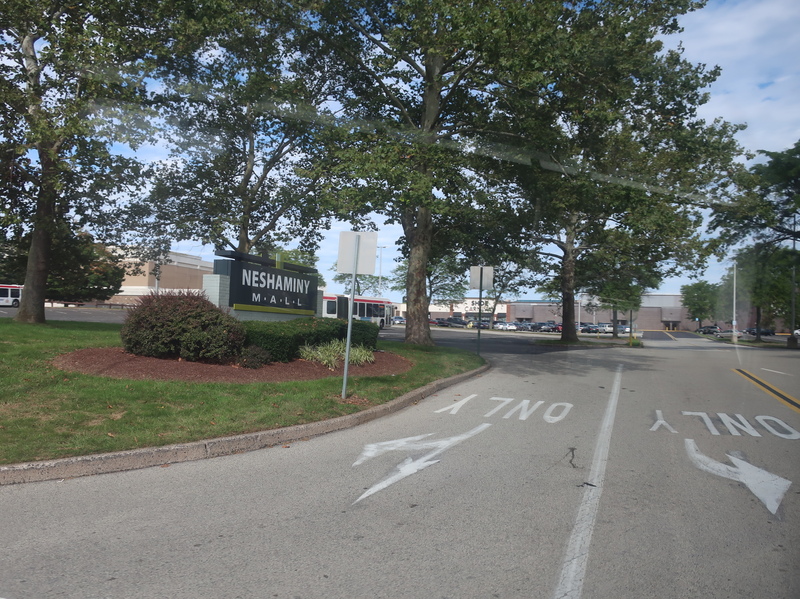 Taking the next exit onto Rockhill Drive, it was time to deviate to the Neshaminy Mall, where most 14 trips begin, as does its limited-stop cousin, the Boulevard Direct. Leaving the mall, we retraced our steps and turned onto Horizon Boulevard, a street lined with restaurants surrounded by parking lots. The street curved right at a Walmart, and it twisted its way down a hill onto Old Lincoln Highway, which featured some mobile home parks. We went under I-276 and passed a giant cemetery, then there were some giant office parks as we merged onto Route 1. 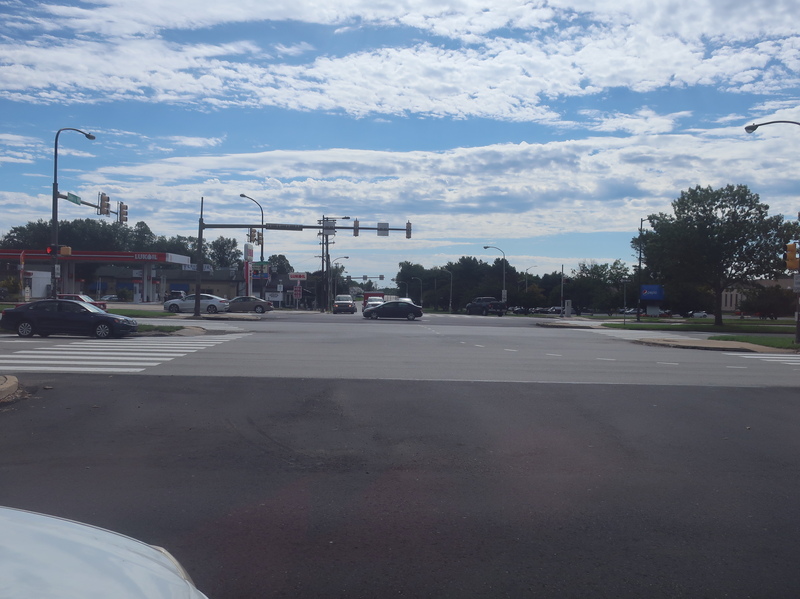 A few seconds later, we crossed Poquessing Creek and entered Philadelphia, when the road became…Roosevelt Boulevard. Uh-oh. The road grew to its classic arrangement of three “express” (barely) lanes and three “local” lanes in each direction. For a little bit, all we could see from the road was trees (hiding the industrial wastelands beyond), so that was somewhat tolerable, but eventually that stuff came right up to the road. Plus, we got to see giant shopping plazas! I really hope these pictures capture how depressing this road is. What else, what else? Well, we went by the general aviation Northeast Philadelphia Airport, but it was blocked by a row of trees. Eventually we encountered a few residential areas, whose residents’ livelihoods are hopefully not affected too much by the countless fumes spewing from the twelve-lane monstrosity in their backyards. The road crossed Pennypack Creek and entered an area with a denser street network and apartments rather than houses. That didn’t mean the suburban businesses had gone away, though – their parking lots were just a little smaller. Oh look, it’s…a little bit denser. Suddenly…yes! We were turning off of the Boulevard! 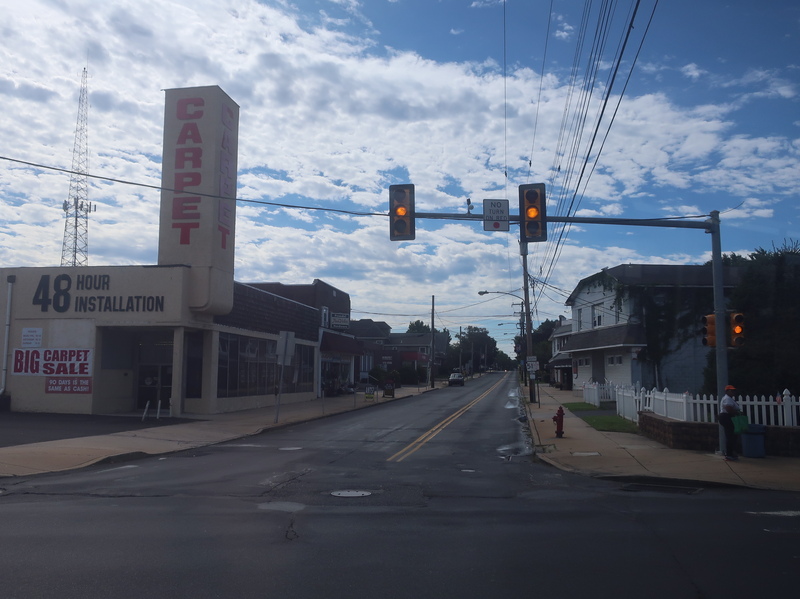 Yes, we were now on Bustleton Ave, and it took us past a bunch of rowhouses, as well as SEPTA’s Comly Depot and a cemetery. And finally, the sight of a train yard meant that we were arriving at our destination, the Frankford Transportation Center. Well, that was a long and arduous trip from the middle of nowhere – I think the Boulevard sucked all the life out of me. Good thing I never have to travel along that road again. Oh wait…there are still a ton of other bus routes that use it. NOOOOOOOOOOOOOOOO! 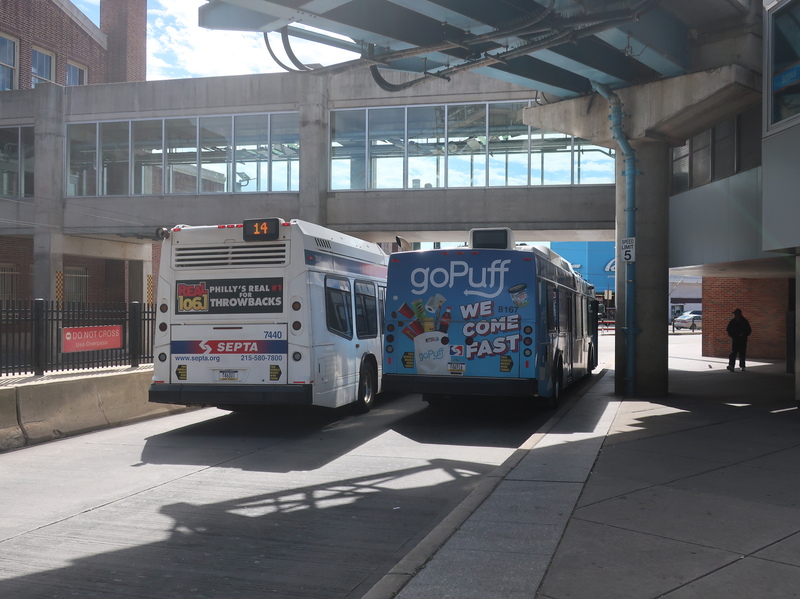 Ridership: It’s one of the busiest routes on SEPTA. In fact, coincidentally enough, it’s the 14th-busiest route on SEPTA! But though the route gets a very respectable 12,340 riders per weekday, it’s not especially efficient or productive, just because it’s so long. But we’ll get to that. Pros: As awful as the Boulevard is, there’s no denying that it has quite a few attractions along it that people want to take the bus to. 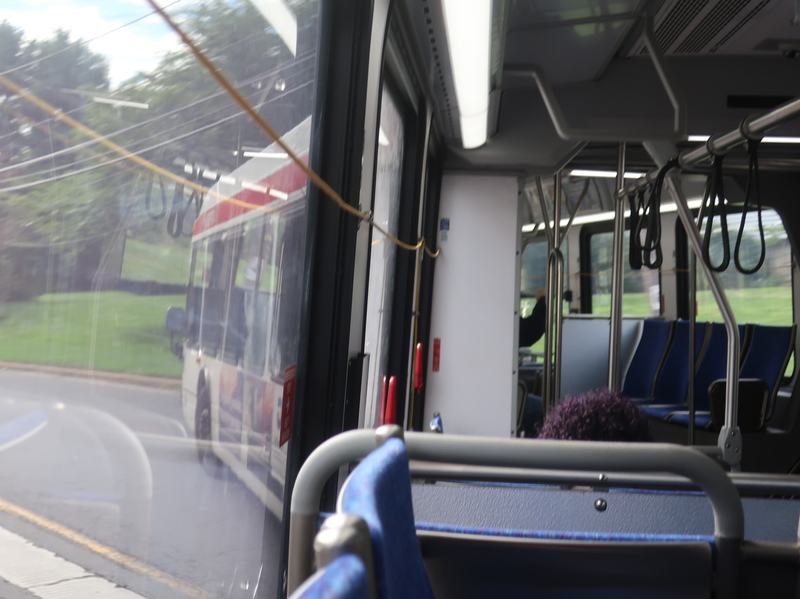 The main trunk of the 14 is beautiful in its directness, sticking to Roosevelt Boulevard up until just before the Neshaminy Mall. 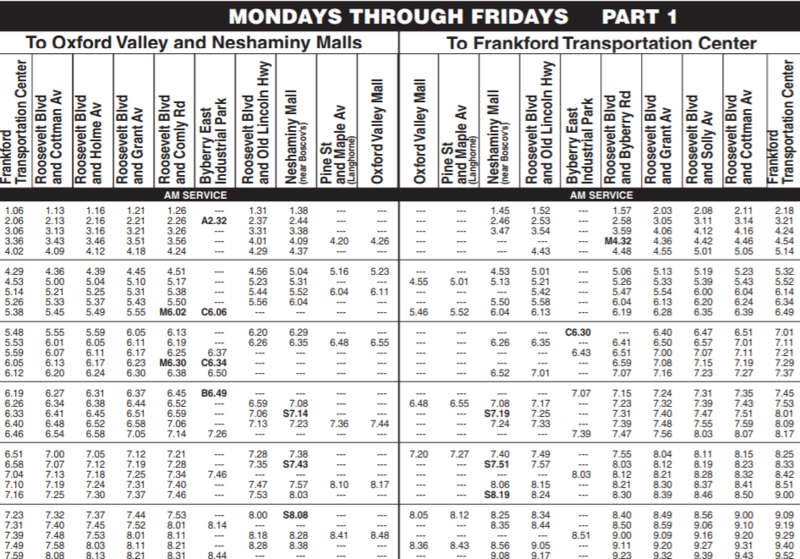 The route’s trunk also has fantastic frequencies: every 5-10 minutes at rush hour (though the peak direction is away from Philly in the morning and vice versa in the evening because of all the industrial parks on the 14’s outer portions), every 15 minutes middays and Saturdays, and every 20 minutes on Sundays. Bear in mind, too, that all of these headways are further supplemented by the Boulevard Direct, which is always just as if not more frequent than the 14 when it’s running – transfers between the two routes are free. 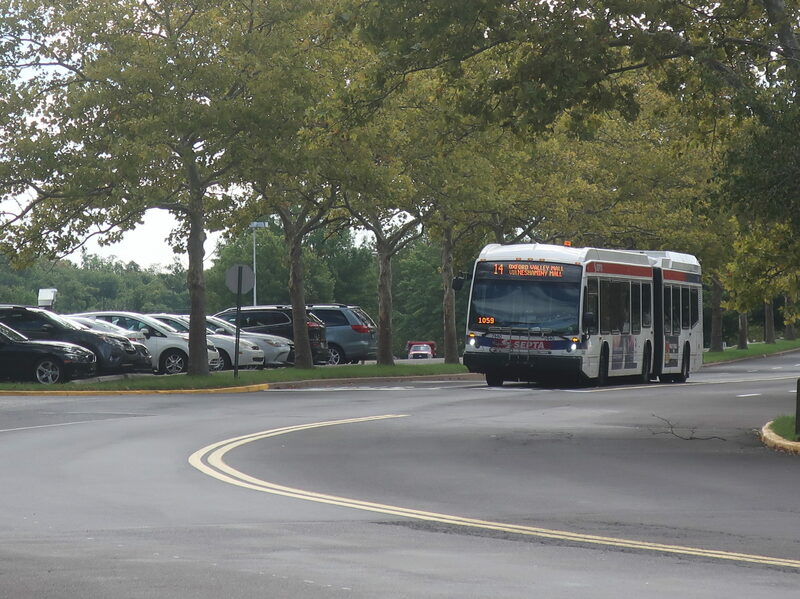 Heck, this route even has overnight service to Neshaminy Mall, and though it’s only every hour, it’s still a great lifeline for employees and residents, especially given how suburban the area is. A simple one first: peak service is less productive than midday service. And when you’re running service every 6 minutes over an up-to-20-mile route, it’s gonna take a ton of resources that would probably be better used elsewhere. You know how many buses the 14 uses during the peak? 24. Speaking of which, this route is sooooooo long. I get that it’s providing a one-seat ride from far-out locales to the El, but the length combined with the short stop spacing (oh yeah, that’s another con) can cause reliability issues and low productivity. Not to mention that doing a full trip to the Oxford Valley Mall on this thing is really difficult, since only some trips run all the way. Frequencies can range from every half hour on weekdays to every 45 minutes on Saturdays to…every 40 minutes on Sundays. Huh, it actually gets better Sunday service than Saturday service. Nearby and Noteworthy: Uhhh…malls? Let’s stick with malls. Although Sesame Place is quite close to the Oxford Valley Mall if you’re looking for some Sesame Street-related amusement park attractions! I’ve thought long and hard about this. For all its flaws, I still have to applaud the 14’s relatively consistent frequency, direct trunk route, and 24-hour service. When you get right down to it, this is a really important route that could be a whole lot worse. That said, I am fully aware of its many problems, and they do drag down the route. In particular, cutting down on the industrial park deviations would be great for simplifying the schedule, although I can’t see that happening without a lot of pushback. Also, there’s the interesting case of the Oxford Valley Mall. Honestly, its service is so bad that I think all 14’s should terminate at Neshaminy, and a separate route with a free transfer can run between there and Oxford Valley. That would improve reliability, create better frequencies to the outer parts of the route, and generally simplify the 14.